Alerts: Open preferences for Email/Text alerts. See the how to setup Email Alerts in Getting Started . To select the drawing, click on the center point of the crosshair and drag to the new location. Release your mouse button to place the crosshair. The tool is selected when a box appears at the center point. Select the crosshair by clicking on it. The properties will appear in the preferences section of your control panel. Or you can right-click on a drawn crosshair tool and select Properties. To draw a support or resistance line, also referred to as a trend, use the Line tool. Select the Line tool from your Charting toolbar. Click on your chart where you want the line to begin. Hold down the mouse button and move to the position you want your line to end. Release the mouse button to place the line on the chart. Select the line drawing by clicking on it. Press the Del (Delete) key on your keyboard. You can also right-click the line drawing and select “Delete” from the drop-down menu. Hold down Control (CTRL) on your keyboard while drawing the line tool to create a straight/flat line. Select the line drawing by clicking on it. The properties will appear in the preferences section of your control panel. Alternatively, you can right-click on a drawn line tool and select Properties. Select the multi-line drawing by clicking on it. You will know the multi-line is selected when boxes appear at the ends of the multi-line. Click on a box and drag it to your desired length. Release the mouse button to place the multi-line drawing. Select the multi-line drawing by clicking on it. Click on the multi-line, not a box, and drag it to the new location. Release the mouse button to place the drawing. Select the multi-line drawing by clicking on it. Press the Del (Delete) key on your keyboard. You can also right-click the multi-line drawing and select “Delete” from the drop-down menu. Select the line drawing by clicking on it. The properties will appear in the preferences section of your control panel. Or you can right-click on a drawn muli line tool and select Properties. 3. Text: Select the font, size, and color of the text. You can also choose to see numbers or letters. Select Text to hide or show your text on the chart. Select from options in the drop-down dialog box to determine how you prefer to display the labeling of each point of the Multi-Line Tool. To illustrate a Rounded top or bottom formation on your futures chart, select the Arc tool in your Advanced Charting toolbar. Move the mouse pointer to the point on the chart that will be the corner of your arc. Hold the mouse button and drag to your endpoint. Release the mouse button to place. Select the drawing by clicking on it. Press the Del (Delete) key on your keyboard. You can also right-click the drawing and select “Delete” from the drop-down menu. Select the drawing by clicking on it. The properties will appear in the preferences section of your control panel. Or you can right-click on a drawn arc tool and select Properties. The Bar Calculator Tool enables you to measure the number of trading days versus actual days that are between two points on the chart. Also calculated on this tool is the number of days that the market closed higher or lower in comparison with the previous day. Select the Bar Calculator Tool from your Advanced Charting toolbar. Click where you would like to start and drag the horizontal line to where you would like it to end. Release the mouse button to place. Select the drawing by clicking on it. You will know the drawing is selected when boxes appear at the corners. Click on a box and drag it to your desired location. Release the mouse button to place the drawing. Select the drawing by clicking on it. The properties will appear in the preferences section of your control panel. Or you can right-click on a drawn bar calculator tool and select Properties. To trade a 123 top formation, place a sell order on a breakdown past the 2 point. Then place a stop loss order just above the 1 point (an industry standard) or just above the 3 point (a more conservative stop loss placement). Select the 123 drawing by clicking on it. The drawing is selected when boxes appear at the 1, 2, and 3 endpoints. Drag to the new location and release the mouse button to place. Select the 123 tool by clicking on it. The properties will show up in the preferences section of your control panel. Or you can right-click on a drawn 123 tool and select Properties. Text / Show Arcs / Snap / Always Show Lines: Select these options to display the 1-2-3 tool the way that you prefer. You can choose to hide or show Text, Arcs, Prediction, and Line. You can also choose whether or not you would like the 1-2-3 Tool to snap to price bars. Show Change Calculation: Select to display the dollar value, percent return on margin, or tics/pips value between price points 1-2 and 2-3. Quantity: Determines the trading quantity used to calculate the $ Value, %ROM, and Tics/Pips value for Change Calculation. Labels: Choose how you would like these values displayed within your chart. None will remove text descriptions, leaving only the line markers. Price will display the market price for each percentage value. Both will display both percent and market price. Reverse changes the labeling from ascending to descending. To identify an H&S top or bottom formation, use the Head & Shoulder tool. Select the Head & Shoulders tool from your Charting toolbar. Position the mouse pointer where you would like to place the Left Shoulder (LS) point and click to place. Move to the valley point between the LS and the Head (H) and click to place. Move to the H point and click to place. Move to the valley point between the Head and Right Shoulder (RS) and click to place. Move to the RS point and click to place. To trade a Head & Shoulders top formation, place a sell order on the break of the Neckline. Your stop loss order should then be placed just above the Head. The stop-loss order can also be placed above the Right Shoulder as a more conservative point. To trade a Head & Shoulders bottom formation, place a buy order on the breakup from the Neckline. Then place a stop loss order just below the Head. The stop-loss order can also be placed below the Right Shoulder as a more conservative point. Select the H&S drawing by clicking on it. The tool is selected when boxes appear at the LS, H, and RS endpoints. Drag to the new location and release the mouse button to place. Select the H&S drawing by clicking on it. Press the Del (Delete) key on your keyboard. You can also right-click the drawing and select “Delete” from the drop-down menu. Select the H&S drawing by clicking on it. The properties will appear in the preferences section of your control panel. Or you can right-click on a drawn Head & Shoulders tool and select Properties. To trade a dart up, place a sell order on the breakdown of the Right Feather (RF) along with a stop loss order just above the Tip. To trade a dart down, place a buy order on the break-up of the Right Feather, and place a stop loss order right below the Tip. Select the drawing by clicking on it. You will know the drawing is selected when boxes appear at the corners. Click on a box and drag it to your desired location. Release the mouse button to place the Dart. Select the drawing by clicking on it. Drag the dart to the new location and release the mouse button to place. Select the drawing by clicking on it. The properties will appear in the preferences section of your control panel. Alternatively, you can right-click on a drawn dart tool and select Properties. Identify any type of wedge or triangle by selecting the Wedge tool from your Charting toolbar. Position the mouse pointer where you would like to place the top point of the triangle and click. Move to the bottom point of the triangle and click again. Position the mouse pointer where you would like to place the final point of the triangle and click to place it. The Inclining Wedge formation occurs when the slope of both lines is up with the lower line being steeper than the higher one. To trade the Inclining Wedge, place a buy on a break-up and out of the wedge or a sell order on a breakdown and out of the wedge. Inclining Wedges with a prior downtrend are anticipated to break down and out, rather than up and out. Select the drawing by clicking on it. Drag to the new location and release the mouse button to place the drawing. Identify a trend fan within a chart by selecting the Trend Fan tool from your Charting toolbar. Position the mouse pointer where you would like to place the main point of your trend fan. Move the mouse pointer to the end of the first line and click. Add as many lines to your trend fan as you would like. To place the last trend, position the mouse pointer at the end of the last line and right-click to place. As the market continues to make its retracement, we can draw another trend line across the next level of support or resistance. The line is a support if the market is moving up and resistance if it is moving down. The last move of the trend was resistance for the first trend line and is now support for the second trend line. The third trend line shows that the market has made a solid retracement down past this third fan line. To trade a Trend Fan, place an order to enter the market on the breakout past the third Trend Fan line. Select the drawing by clicking on it. You will know the drawing is selected when boxes appear at the ends of the lines. Click on a box and drag it to your desired location. Release the mouse button to place the drawing. Select the drawing by clicking on it. The properties will appear in the preferences section of your control panel. Or you can right-click on a drawn trend fan tool and select Properties. Identify an Inclining or Declining Channel by selecting the Trend Channel tool from your Charting toolbar. Position the mouse pointer where you would like to place the top-left point of the channel and click. Move to the bottom-left point and click again. Move to the bottom-right point and click again. Position the mouse pointer where you would like to place the top-right and final point of your channel and click to place the point. To trade a Narrow Sideways channel, place an order to buy on a break-up and out of the channel, or sell on a breakdown and out of the channel. To trade an Inclining channel, place an order to sell on the breakdown and out of the channel. To trade a Declining channel, place an order to buy on the break-up and out of the channel. Select the channel by clicking on it. You will know the channel is selected when boxes appear at the corners. Click on a box and drag it to your desired location. Release the mouse button to place the tool. Select the channel by clicking on it. Press the Del (Delete) key on your keyboard. You can also right-click the channel and select “Delete” from the drop-down menu. Select the channel by clicking on it. The properties will appear in the preferences section of your control panel. Or you can right-click on a drawn Trend Channel tool and select Properties. Select the Horizontal channel by clicking on it. Press the Del (Delete) key on your keyboard. You can also right-click the channel and select “Delete” from the drop-down menu. Select the Horizontal channel by clicking on it. The properties will appear in the preferences section of your control panel. Or you can right-click on a drawn horizontal channel tool and select Properties. This chart shows how the market made lower highs and lower lows, while still maintaining the overall downtrend. Each retracement was about 50% of the last move before they continued on in their original direction. Select the channel by clicking on it. The properties will appear in the preferences section of your control panel. Or you can right-click on a drawn N% ruler tool and select Properties. The Arrow tool enables you to draw arrows to help point out areas of interest on your chart. Position the mouse pointer where you want to place the point of the arrow and click the mouse button. Drag the mouse pointer to the location you would like to end the arrow. Release the mouse button to place. Select the arrow drawing by clicking on it. The arrow is selected when boxes appear at the ends of the line. Click on one of the boxes and drag it to the desired length. Release the mouse button to place the end point of the line. Select the arrow drawing by clicking on it. Click on the arrow, not an end box, and drag it to the new location. Release the mouse button to place. Select the arrow drawing by clicking on it. Press the Del (Delete) key on your keyboard. You can also right-click the line drawing and select "Delete" from the drop-down menu. Select the drawing by clicking on it. The properties will appear in the preferences section of your control panel. Or you can right-click on a drawn arrow tool and select Properties. 2. Line: From here you can choose the color, line style, and line thickness of an arrow. 3. Arrow Fill: This option allows you to choose the fill color of the arrow point(s). 4. Arrow Point: This option allows you to choose which end you would like the arrow point to be placed. Choose from "on end one", "on end two", or "on both ends". 5. Snap: Select this option to place an arrow end directly on a price bar. You can snap to open, high, low, or close. The Text tool enables you to type text on the Chart. Select the Text tool in the Notation toolbar. Click on the chart where you would like to place the upper left corner of the text box. Drag the text box to the lower right corner of your desired text box. Release the mouse button to place. Once the box is drawn, the Text Tool Options window will open. Enter the text, set the font, size, position, color, and style of the text. Select a border and background if you would like. Click "OK" when finished and text will be placed on your chart. Select the text box by clicking on it. Continue holding down the mouse button to drag text to the new location. Release the mouse button to place. Select the text box by clicking on it. Press the Del (Delete) key on your keyboard. You can also right-click the text box and select "Delete" from the drop-down menu. Select the text box by clicking on it. The properties will appear in the preferences section of your control panel. Or you can right-click on a drawn text tool and select Properties. 2. Text Tool: You can change the size, font, and color of the text. 3. Outline: Click on the down arrow to view a list of colors for the outline of the text box. 4. Alignment and Font Style: These buttons determine how you want your text to appear on the chart. You can align the text left, center, or right, and can also bold, italicize, underline, and strikethrough. 5. Custom Size: Select this check-box to manually adjust the size of the Text Tool window. 6. Text: Use the Text entry window to cut, copy, or paste information. The Box tool enables you to draw square or rectangle shaped drawings on the chart. Select the Box tool in the Notation toolbar. Click where you would like to place the top-left corner of the box, hold down the mouse button and drag to the location of the bottom-right corner of the box. Release the mouse button to place. Select the rectangle drawing by clicking on it. The drawing is selected when boxes appear at the corners of the graphic. Click on one of the boxes and drag it to the desired length. Release the mouse button to place. Select the rectangle drawing by clicking on it. Click on the drawing, not an end box, and drag it to the new location. Release the mouse button to place. Select the rectangle drawing by clicking on it. Press the Del (Delete) key on your keyboard. You can also right-click the line drawing and select "Delete" from the drop-down menu. Select the drawing by clicking on it. The properties will appear in the preferences section of your control panel. Or you can right-click on a drawn box tool and select Properties. 2. Line: Choose the color, style, and thickness of the line surrounding the box. 3. Background: Change the fill color of the box. 4. Snap: Select this option to place a box corner directly on a price bar. You can snap to open, high, low, or close. The Circle tool enables you to draw circle shaped drawings on the chart. Select the Circle tool in the Notation toolbar. Click on the chart where you would like the circle to start. Continue holding down the mouse button and drag the tool until it has formed a circle. Release the mouse button to place. Select the circle drawing by clicking on it. The circle is selected when boxes appear at the corners of the graphic. Click on one of the boxes and drag it to the desired length. Release the mouse button to place. Select the circle drawing by clicking on it. Click on the box, not an end box, and drag it to the new location. Release the mouse button to place. Select the circle drawing by clicking on it. Press the Del (Delete) key on your keyboard. You can also right-click the line drawing and select "Delete" from the drop-down menu. Select the circle drawing by clicking on it. The properties will appear in the preferences section of your control panel. Or you can right-click on a drawn circle tool and select Properties. 2. Line: Choose the color, style, and thickness of the line surrounding the circle. 3. Background: Change the fill color of the circle. 4. Snap: Select this option to place the circle directly on a price bar. You can snap to open, high, low, or close. Use the Dollar calculator to find the dollar value between two points on the chart. Select the Dollar calculator tool from your Calculators toolbar. Click on your chart where you want the calculator to start and drag to where you want the calculation to be completed. Release the mouse button to place. The dollar amount of the chart movement will be calculated from the beginning and end point values and will be displayed in the center of the line. Select the drawing by clicking on it. Hold down the mouse button and drag to the new location. Release the mouse button to place. Select the drawing by clicking on it. Press the Del (Delete) key on your keyboard. You can also right-click the channel and select "Delete" from the drop-down menu. Select the dollar calculator by clicking on it. The properties will appear in the preferences section of your control panel. Or you can right-click on a drawn dollar calculator tool and select Properties. 2. Line: Choose the color, style, and thickness of the line. 3. Quantity: Shows the number of shares/contracts included in the calculator transaction. Select and type the desired quantity to change the value. 4. Font: From here you have the ability to change the size, font, and color of the text. 5. Show Text: Uncheck this box to hide the text. 6. Snap: Select this option to place the circle directly on a price bar. You can snap to open, high, low, or close. 7. Value / % Value / *Pips *fx only: In Track n’ Trade Live Forex you can choose to display the dollar calculator as a $ Value, % Value, or as Pips. 8. Details: This section gives you the price value of Point 1 and Point 2 on the Dollar Calculator. You can modify these values by highlighting and typing a new value. The Risk/Reward calculator is used to find the difference between two points of the risk and reward zone. Select the Risk/Reward tool on your Calculators Toolbar. Click on your chart where you want your technical formation to begin and drag to cover the area between your initial order and your risking stop loss order. The calculator will create an equal-sized reward area that can be stretched to the proper distance you expect the graph to retrace. The numbers in the tool indicate the dollar amount of risk and reward. When the chart is trading within the risk area (negative number), you are risking your own money. When the chart is trading within the reward area (positive number), you are risking OPM or "Other People’s Money." Use the Risk/Reward calculator on all trades to calculate where your order entries and exits should be placed. Select the risk vs. reward by clicking on it. The properties will appear in the preferences section of your control panel. Or you can right-click on a drawn risk vs. reward tool and select Properties. 3. Risk Color: Change the highlight color of the Risk text. 4. Reward Color: Change the highlight color of the Reward text. 5. Quantity: See Dollar Calculator Preference Tab. 6. Price/Point Difference: Either view the Point or Price difference of the risk and reward calculator. 7. Font: Change the size, font, and color of the text. 8. Show Text: Uncheck this box to hide the text. 9. Snap: Select this option to place the circle directly on a price bar. You can snap to open, high, low, or close. 10. Details: This section gives you the price value of Point 1 and Point 2 on the Risk/Reward Calculator. The Order Placement Tool is used to place custom orders on the chart. The order is not placed until confirmed from the Order Placement dialog. Note: to denote the Order Placement tool is in effect the mouse's icon will change to an arrow. This tool is also found in the Trade Tab above the order buttons for easy use. To bring up the Order Placement dialog first click on the chart approximately where you would like the order placed. At the top of the dialog it will reflect the Contract/Currency Pair along with the rate at which the order was initially placed. Qty (Quantity): Either type in the quantity or use the up and down arrows. MKT (Market Order): A market order does not specify a price; it is executed at the best possible price available. A market order can keep you from 'chasing' a market. MIT (Market If Touched): Similar to a limit order, orders to buy are placed below the current price; orders to sell are placed above the current price. MIT orders fill once the limit price is touched or passed through. (Some exchanges do not allow MIT orders). LMT (Limit Order): Limit Orders to buy are placed below the current price; limit orders to sell are placed above the current price. The market may touch a limit price several times, without filling. In most cases, the market must trade better than the limit for the order to fill. STP (Stop Order): Place a buy stop order above the market price; place a sell stop order below the market price. A stop order becomes a Market Order when the specified price is reached. Track ‘n Trade Live has incorporated concepts and theories from leading technical and fundamental educators in the industry allowing you as a trader to apply their studies easily to your trading. In this section, you will learn basics about their theory and how to apply it in Track ‘n Trade Live. To identify an Elliott Wave on a chart, select the Elliott Wave tool from your Advanced Charting toolbar. Click on the first point to place it. Continue throughout the wave by clicking on each point 1-5 and ABC to place. When you get to the last point, C, the drawing is complete. The basic idea of the Elliott Wave theory is that a market rises in a series of five "waves" (as he called them), and a market declines in a series of three declines. Elliott said the market rises on the first wave, declines on the second, begins to rise again on wave three, has a period of decline again on wave four, and finally, completes the rise on wave five. The period of correction is referred to as a three-wave correction where the market declines for wave A, begins to rise for wave B, and falls again for wave C.
Elliott went on to further explain that a complete market cycle consisted of a 144 wave cycle, broken down into an 89 wave bull cycle, and a 55 wave bear cycle. This is based on his observation of Fibonacci’s Golden Ratio. The series of numbers Fibonacci describes shows a relationship of 1:0.618. Elliott further showed that a market usually rises or falls based on this wave cycle. Each wave in the cycle has its own characteristics. Four: Noted to be very intricate, yet still a consolidation. One of Elliott’s main rules is that in a five-wave advance cycle, wave four can’t overlap wave one. B: Follows wave A of the downtrend and is often hard to spot. Should result in a third wave continuing down. 3. Font: Select the font, size, and color of the text. You can also choose to bold or italicize. 5. Points: Change how the points of the Elliot Wave are labeled from the points drop down dialog box. You can apply this theory to your charts by selecting the Gann Fan from drawing tools toolbar. Click where you want the Fan to start and continue to hold down the mouse button until reaching the top-right position of the fan. Release the mouse button to place. Gann’s techniques require that charts be drawn with equal time and price intervals so that a rise/run of one price unit for each time unit (called a 1 x 1 trend or angle) will equal a 45-degree angle anywhere on the chart. Gann believed that the ideal balance between time and price exists when prices rise or fall at a 45-degree angle relative to the time axis. A Gann Fan is used to define a market direction or a new trend. For example, a bull market exists if prices are maintaining strength between the 1x2 lower line and 1x2 higher line. A bear market would be the exact opposite of the previous scenario. The Gann Fan is made up of nine angles based on this concept. These trend lines are used to indicate support and resistance levels. When one line is broken (by the entire day's price range) prices should move to the next line. The drawing of these lines should start from either a market top or bottom. It is important to note that this theory is based on a squared 45-degree angle on the chart. Obviously, a 45-degree angle drawn on a chart is no longer 45 degrees when the scale is changed without a change to the opposite scale as well. To "square" the Gann Fan to the current chart’s scaled settings, hold down the CTRL key on your keyboard while clicking and rescaling with the mouse pointer. Some Gann experts have reported that to get a truly "squared" chart, one must set the scaling to 8 price bars per inch for the width and 4 price bars per inch for the height. 3. Font: Select the font, size, and color. You can also choose to bold or italicize your text. 4. Snap: Select to have the drawing snap to the price bars. You can apply this theory to your charts by selecting the Andrews Pitchfork from your drawing tools toolbar. Click where you want the handle of the pitchfork to be (at the end of the previous trend). Your next two clicks will form the base of the fork or the tops of the next two trends. You can elongate the pitchfork to the length desired. Click to place. Select the drawing by clicking on it. Press the Del (Delete) key on your keyboard. You can also right-click the channel and select “Delete” from the drop-down menu. Distance scaling is determined from the starting point of the Pitchfork handle to the middle cross line. 3. Show Extensions: Select the box next to the number of extensions you want to be added to your pitchfork drawing. The odd numbers are placed below, even numbers are placed above. 4. Font: Select the font, size of the font, and color of the text. You can also choose to bold or italicize your text. Select the checkbox next to Show Text to hide/show your text on the chart. 5. Snap: Allows the tool to snap to price bars when moved. To measure the different retracement levels within a market, select the Fibonacci Ruler tool from your drawing tools toolbar. Click on the chart where you would like the ruler to begin. Hold the mouse button down and move to the lower right position of the rule. Release the mouse button to place. With your Preferences Tab open, select the drawing by clicking on it. The properties will appear in the preferences section of your control panel. You may also right-click the drawing and select Properties to open the Fibonacci Ruler preferences within the Preferences Tab. Background: Select the color you want for the background of the Fibonacci Ruler. Fib: Default Fibonacci Ruler. Check, blue square, or uncheck to show, customize or hide Fibonacci lines. Retracements: Check Retracements to display Fibonacci retracements values on your drawn Fibonacci Ruler. Projections: Check Projections to display Fibonacci projection values on your drawn Fibonacci Ruler. Predictions: Check Predictions to display Fibonacci prediction values on your drawn Fibonacci Ruler. Time Zones: Check Time Zones to display Fibonacci time zone values on your drawn Fibonacci Ruler. Squaring / Division: Choose between displaying the Fibonacci Ruler being calculated as squared (78.6%) or displaying it as a division (76.4%). Font: Select the font, size of the font, and color of the text. You can also choose to bold or italicize your text. Select the checkbox next to Show Text to hide/show your text on the chart. Snap: Select to have the Fibonacci Ruler snap to price bars when moved. Checked: line will appear with default Fibonacci values. Blue square: line will appear with the option to enter a custom percentage value. Unchecked: line will not appear within the Fibonacci Ruler on the chart. To measure the different retracement levels within a market, select the Fibonacci Arc tool from your drawing tools toolbar. Move the mouse pointer to the point on the chart that will be the corner of your arc. Hold the mouse button and drag to your endpoint. Release the mouse button to place. 1 . 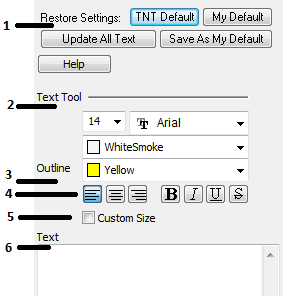 Restore Settings: TNT Default will change your settings back to the original software settings. My Default will change current settings to your personalized default settings. Apply To All Charts will apply your selected settings on all open charts. Save As My Default will save your current personal settings. 4. Snap: Select to have the tool snap to price bars when moved. The Fibonacci Time Zone uses Fibonacci numbers rather than the percentages used in the Ruler and Arc tools. Select the Fibonacci Time Zones from your drawing tools toolbar. Click where you want the upper left point. Hold the mouse button and drag to the bottom right position. Release the mouse button to place. Fib Time Zone Tool: You can choose the color, line style, and line thickness of your lines.